Winchester Rim Dia. = .063"-.065"
My C.O.A.L. Max = 2.55"
Leade Length = 2.235"-2.085" 'Slug' Case Len =.150"
Wanted to 'see' what room there is for a projectile within the breech so I chambered a test boolit with hard foam & measured its position with a dowel, just short of the muzzle; then chambered a dummy rnd with my test boolit = 2.54" C.O.A.L. There was a .050" difference between the two, representing what I envision as "jump". It would seem I probably can't eliminate much of this with the 2.55" Max C.O.A.L. I've sorta established. Pls. feel free to PM me with any comments & suggestions. That's excellent data, I wish all my customers would post data like that for their guns. So 0.145" distance between the case mouth and the beginning of the rifling? The only unknown is the angle of the throat, but if it is a SAAMI chamber then the angle is pretty steep. Anyway, bear in mind that the design program's "rifle throat length" estimate doesn't make sense for bore riding bullets. Instead, figure on the length of the front band plus a portion of the crimp groove, say 0.020" (it's not precise and can depend on exactly how you set your seating & crimping die). So if you wanted to, you could make your front band longer, though I wouldn't crowd the rifling with the front band on a lever action. -- if you choose a plain base bullet, I would recommend a bottom band no less than 0.100" long ('plain base, define length=0.100"'). The bottom band is prone to heat shrink and the shorter it is, the more it will heat shrink. -- the standard 0.055" long crimp groove is plenty for this application. Your Beartooth bullet looks like it might be a Rob Applegate design, or at least inspired by an Applegate design. -- Yes, Plain Base, I failed to mention. -- Understand about the 'thin' Base Band, thanks. -- .050" Crimp Groove still seems short to me, so would going to .070" Crimp Groove still be OK, design wise? -- I'm inclined to make the Front Band .110" then, and show a modicum of confidence in my observations. in Racine, WI. or mayhaps in WI altogether, eh. -- You failed to take this opportunity to chide me in my alloy selection. May I assume it will still be effective in this application? Pending your response to this reply, I'm prepared to commit. Thanks again Mr. Lynch. walstr wrote: .050" Crimp Groove still seems short to me, so would going to .070" Crimp Groove still be OK, design wise? 070 will work, it's just not necessary. The purpose of providing several different crimp groove lengths is simply to maintain reasonable angles as the groove depth changes. I.e., Keiths have deeper grooves therefore they need a longer crimp groove to maintain reasonable crimp groove angles. I keep saying that I am going to automate the crimp groove design since few people seem to understand what it is for. WW & 2% tin would not be my first choice for a heavy bullet, but it is acceptable, providing the bottom band is long enough to avoid severe heat shrink. Thanks for the pic of the upset slug, it shows a typical SAAMI 45/70 chamber -- significantly longer than the case, then an abrupt lead angle. As a rule of thumb, Marlins of all calibers seem to stick close to SAAMI chamber dimensions. FYI I'm guessing you made your attachment so small in order to meet the file size limit for attachments? When I save an edited jpeg, my graphics software gives me an option to "optimize" the file. I typically choose about 70% optimization for web pictures -- that compresses the file. You lose some quality but it's usually good enough for web viewing. An optimized 800 pixel wide jpeg is usually around 100kb. -- RE: CWW+2% Tin; you corrected my design parameter on that account. Thanks. walstr wrote: .070" Crimp Groove I envision, is intended to better accommodate a range of case lengths 2.085" thru 2.095" , without adjusting the Seating Die. It doesn''t really work that way, especially on a lever action where the purpose of the crimp is to prevent the bullet from being pushed further into the case by the magazine spring. If the bullet starts to slide into the case, it may continue to slide until the case hits the top of the crimp groove. In any event, even a 0.045" long crimp would allow 0.010" of wiggle room. Sorry about the difficulties with your photo size. Every graphics program is different, but all of them should allow you to crop and scale your photo to 800 pixel wide and then "optimize" or compress the file. It's an essential skill for posting photos on the web, otherwise the photos don't fit on the page and they consume a lot of bandwidth for both the host and the viewer. For future reference, you might try experimenting with linking images from photobucket, flicker, or one of the other photo sharing sites, rather than attaching photos to the forum. Photobucket is not as fussy about file size, and it's not my concern since it uses THEIR bandwidth rather than MY bandwidth. The only problem with posting photobucket images on forums is that sometimes people close their photobucket account and then the image is no longer visible to forum readers. So if you use photobucket, don't close your account! I see our weather is about identical to yours. But I'm an urban dweller & you, like my son in Driggs, ID are probably of the opinion that "...if it ain't froze in Winter, it's gosh awful gettin' 'round in the mud!" I was thinking more about your latest response re: Crimp Groove length. I was concerned my understanding/mental picture was inaccurate, and I did not wish to design a mold based on assumptions, so, I experimented seating & crimping 2.080", 2.085" & 2.095" cases with my "test bullet". These photos are thru a 6x bubble in my little bench spy glass. I also ran the compression option of my Microsoft Picture Mgr. bringing them down to about 75KB. I hope these are useable. Maybe not apparent here, but the case ID didn't seem like it would "catch" on the lower band lip. I gave it several light taps with a small wooden mallet & it easily traveled into the case just passed the crimp groove. does a good job of RESIZING my neck area on the way to a 'roll' crimp. They were patient & helpful, but finally suggested I consider buying the RCBS Cowboy die set to better handle cast boolits--ya think! A downside to the RCBS Cowboy dies, is their "plunger" internals do not pop out via spring clip like the Dillon sets do. It's of some concern because I intend tumble lubing & extra steps are needed to "clean the noses", eh. So, I think shown on the previous post here, my 2.080" case is .005" shorter than my established 2.085" min. case & does not provide a reliable crimp as setup for a 2.095" max. case length. Ya know, for such a large cartridge, I never thought I'd be mincing words & thoughts about .010"...go figure. My Lee Power Case Trimmer indexes on the rim's front face & my Dillon loader indexes on the rim's rear/breach face, sooo, in conclusion, pls. change my submitted design to have a .070" Crimp Groove. p.s. I'm an amateur blacksmith & have been mostly involved in outdoor gear, e.g. cooking, rendezvousing, etc. I'd like to make a some-somethin' for your trouble; bent horseshoes for hanging _____________? My fire pit/spits get a little heavy, but you get the picture. walstr wrote: the Redding 45-70 die set does a good job of RESIZING my neck area on the way to a 'roll' crimp. Unfortunately, that is a common problem these days. Not just Redding, though you're not the first to complain about Redding dies squishing the loaded cartridge. You seem to share my interest in doing experiments and learning how things work. I appreciate your detailed information, I wish all my customers would post stuff like that. The left side is more or less correct, the right side is incorrect. If you want a flat bottomed groove then I suggest crimping in a lube groove rather than a crimp groove. Your Beartooth bullet appears to have a puny crimp groove, puny both in length and in depth. That could be part of the problem. My crimp grooves are the same depth as the lube grooves -- 0.417" diameter in your case. Another factor in bullet retention, a very important factor, is neck tension. This can depend partly on the brass -- some brass has better "memory" than other brass -- and partly on the expander plug diameter. The typical expander plug, as it comes from the factor, is too big, reducing case neck tension. Off the top of my head, I can't remember the optimal expander diameter but want to say 0.006" - 0.010" less than the bullet diameter. And it will vary depending on the bullet alloy. A soft bullet requires a bigger expander plug than a hard bullet, because excessive neck tension can squash a soft bullet when it is seated (pull a bullet from a dummy round and measure it to see if it was squashed). But it as long as it is not squashed, there is no harm in having lots of neck tension. Neck tension provides about 50% of the grip on the bullet, if not more. Also, seating dies that squish the cartridge seem to reduce neck tension -- yet another reason to avoid those seating dies. I don't shoot a 45/70, so I can't speak to that cartridge, but in my Marlin 357, I use a very light crimp. It's more of a "tuck" than a crimp, simply tucking the flared case mouth in slightly. If I didn't "tuck" the case mouth, it would present a sharp edge that could interfere with chambering. So it's the neck tension that is doing most of the gripping, and I haven't had any problem with bullets moving around in my Marlin. Revolvers, on the other hand, need a "hard" crimp and lots of neck tension to prevent the bullet from "walking out" under recoil. I have had bullets "walk out" in 44 mag revolvers, even with a hard crimp. With one gun/load combo, the only way I could keep the bullets in the case was to use newer cases or to anneal the necks on old cases. Otherwise the older cases seemed to lose their "memory" and would not grip as tightly as new cases. I will try to post a pic of my 357 Marlin ammo tomorrow, to show how I crimp it. That 'img' thing you referred to was from your forum post's top tool bar. I added some CR-LF [return] presses to help position the images, guess it didn't. Sorry for that distraction. I ran to the bsmt. to measure the test bullet's crimp groove; it was .437", thus only .012" [[.461-.437]/2] available to the case' edge. Puny indeed, 1/2 of your design offering of .022" [radially; darn it, I almost got to use 'annulus' in a conversation, guess I'll save that for my next donut order!]. This is not to say I was making assumptions, but rather, I didn't know what I didn't know--- again. I ran your design prog. again, w/no crimp groove, and manipulating the "g to b" ratio, achieved just what I thought I required, e.g. .0734" groove length. Most interesting, however I'll stay with my decision to have a .070" Crimp Groove, as your depth will nicely accommodate the case edge thickness under varying circumstances. Pls. 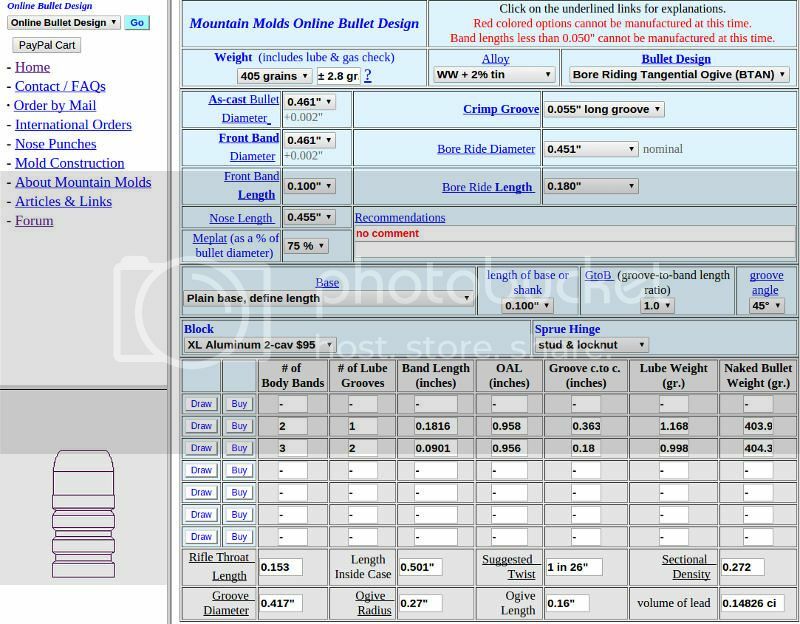 proceed with my order for some awesome lead pills, with the above .070" change. I feel the learning curve flattening. I truly hope others will benefit from your forums --- no, I'm sure of it. p.s. Yesterday, I was tapping in a test bullet from the muzzle, it fell over onto the bare bsmt. floor. When I picked it up, the barrel was slightly scratched at the muzzle, but the stock came apart in 4 pieces! I can see how the grain turned from the grip forward & severely compromised its strength. Some Dark Elmer's exterior glue did well. Now I know better where to evaluate a stocks' grain; it ain't all about a beautiful finish, eh.